Upcoming meetings and seminars to be attended by the Bio-Concepts sales staff. 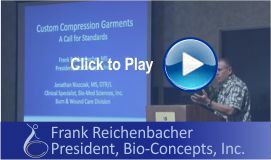 Bio-Concepts has been handcrafting quality wearable and functional pressure garments since 1980. Our designers are the most innovative in the industry. We can make a therapeutic, comfortable, even fashionable pressure garment for any patient from head-to-toe to deliver any range of pressures in any one of 30 colors and six different fabrics. Bio-Concepts custom-made pressure garments are ideal for treatment of a wide variety of medical conditions including burn scar management, long-term management of primary and secondary lymphedema, and Sensory Processing Disorders. Any pressure range is available in a wide array of colors, fabric styles and design options. Now we have combined pressure garment technology with proven efficacy of silicone, particularly useful in burn rehabilitation. As a U.S., F.D.A. certified medical device manufacturer, our custom (made-to-measure) compression garments are available only under doctor's orders.